Explain export strategies for global management. Explain standardization strategies for global management. Explain multidomestic strategies for global management. Explain transnational strategies for global management. A major concern for managers deciding on a global business strategy is the tradeoff between global integration and local responsiveness. Global integration is the degree to which the company is able to use the same products and methods in other countries. Local responsiveness is the degree to which the company must customize their products and methods to meet conditions in other countries. The two dimensions result in four basic global business strategies: export, standardization, multidomestic, and transnational. These are shown in the figure below. An export strategy is used when a company is primarily focused on its domestic operations. It does not intend to expand globally but does export some products to take advantage of international opportunities. It does not attempt to customize its products for international markets. It is not interested in either responding to unique conditions in other countries or in creating an integrated global strategy. A standardization strategy is used when a company treats the whole world as one market with little meaningful variation. The assumption is that one product can meet the needs of people everywhere. Many business-to-business companies can use a standardization strategy. Machines tools and equipment or information technologies are universal and need little customization for local conditions. CEMEX, the Mexico-based cement and building materials company, was able to expand globally using a standardization strategy. Apple uses a standardization strategy because its products do not have to be customized for local users. An iPod will look the same wherever you buy it. Domino’s Pizza also uses a standardization strategy. Although toppings may vary to meet local tastes, the basic recipes are the same and the store model of carryout or delivered pizza is the same everywhere. A standardization strategy produces efficiencies by centralizing many common activities, such as product design, gaining scale economies in manufacturing, simplifying the supply chain, and reducing marketing costs. A multidomestic strategy customizes products or processes to the specific conditions in each country. In the opening example, Lincoln Electric should have used a multidomestic strategy to customize its manufacturing methods to the conditions in each country where it built factories. Retailers often use multidomestic strategies because they must meet local customer tastes. 7-Eleven is an example of a company using a multidomestic strategy. It tailors the product selection, payment methods, and marketing to the values and regulations in each country where it operates. For example, in Japan, 7-Eleven allows customers to pay their utility bills at the store. In a company with a multidomestic strategy, overall management is centralized in the home country but country managers are given latitude to make adaptations. Companies sacrifice scale efficiencies for responsiveness to local conditions. Companies benefit from a multidomestic strategy because country managers understand local laws, customs, and tastes and can decide how to best meet them. 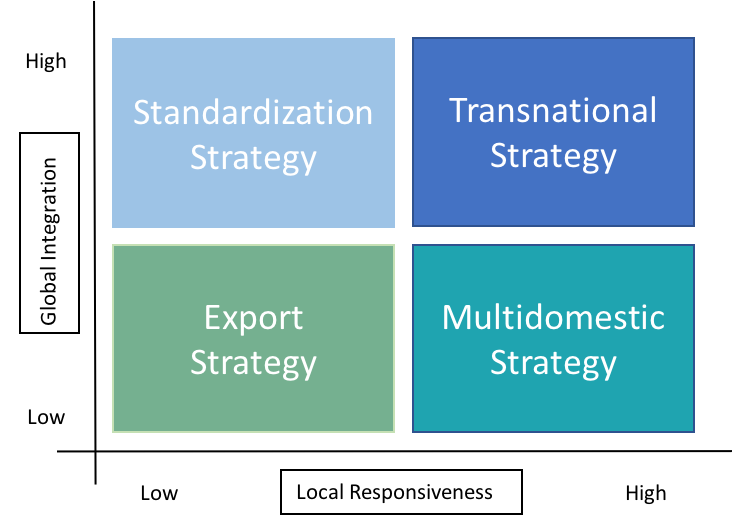 A transnational strategy combines a standardization strategy and a multidomestic strategy. It is used when a company faces significant cost pressure from international competitors but must also offer products that meet local customer needs. A transnational strategy is very difficult to maintain because the company needs to achieve economies of scale through standardization but also be flexible to respond to local conditions. Ford Motor Company is adopting a transnational strategy. Ford is producing a “world car” that has many common platform elements that accommodate a range of add-ons. That way Ford benefits from the standardization of costly elements that the consumer does not see but can add custom elements to meet country laws, can customize marketing to local standards, and can provide unique products to meet local tastes. In today’s economy almost all companies must consider the opportunities presented by globalization, but global operations also present significant risks. Companies must research and plan thoroughly before engaging in international operations. And they must choose a strategy that matches their capabilities and objectives. The economies of standardization and the responsiveness of customization are competing pressures companies must resolve. The appropriate strategic choice is essential for a company to make the right choices.